Shane Macomber/Vail DailyKindergarten student Sofia Aguilar peeks at the photgrapher during a lesson in Donna Dino's class at Brush Creek Elementary. “That’s 85 more kindergartners than last year,” Strakbein says. Strakbein typically looks at two main pieces of data for kindergarten numbers: birth rates and growth. In 2000, the year most of today’s kindergartners were born, there were 774 births, says Strakbein, versus 717 in 1999. 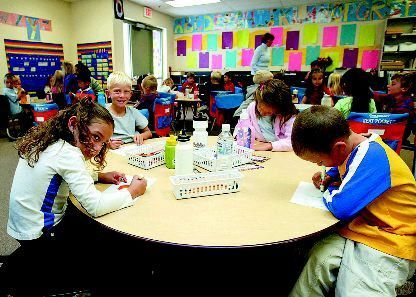 Historically, the school district can expect 85 percent of those children in kindergarten five years later. “Certainly, we know that not all those kids were born here, and we know they don’t always stay here,” says Strakbein. Somehow, however, that 8 percent increase has transformed into a 18.5 percent increase. “This is one of those very unusual years,” Strakbein says.New housing subdivisions are a factor. Eagle Ranch is proving popular in Eagle and Chatfield Corners in Gypsum has attracted families. But this still does not solve the puzzle, as far as Strakbein is concerned.